Mr. Albin Anthony has been the role model and COO of Sacred Heart School since its inception. He, by academic qualification is a BE(Mechanical Engineer) from Pune University. 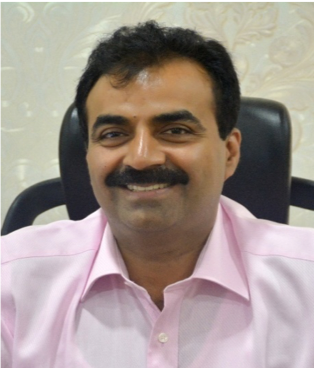 Professionally he is not only the COO of Sacred Heart School, but also has been a part of the family business in the fields of construction, manufacturing engineering equipments, setting up chemical plants also he is involved in numerous social endeavors. As a child he was very good in academic and sports, his parents had always guided him on how to confront the downfalls in an optimistic manner, which ultimately helped him to build leadership qualities and become a guide to all. Sacred Heart School was established on 20th April,2001. The main motive of setting up this school was not only to impart excellent education but also to instill life skills in students which in today’s world is imperative. Mr. Albin Anthony firmly believes that education is not only about theoretical learning, it should also involve learning life skills, imbibing technological efficiency to adapt themselves to this ever-challenging world of artificial intelligence and become dexterous global citizens. Where the world is increasingly driven by algorithms, Sacred Heart School strives to nurture the andorithms like compassion, justice, ethics, discipline and humanity in our school, making it a role model for the world to follow. Together form the three pillars on which the beautiful ‘Faculty Cultivation’ is nurtured and harvested as innovative, inspiring and intense teaching learning processes at Sacred Heart School. Three pronged health and medical supportprotocols implemented by the school helps in nurturing a special bond of affection in the teachers and their families towards the school and instills feeling of ownership. - Medico Emergency Teacher-Management group : In case of any medical emergencies affecting a teacher or a member of teachers family, this group supports the affected member, in admission and treatment at best partner hospitals. The cashless medical insurance takes care of all expenses. Arranging urgent appointments with best Doctors, arranging ambulances or diagnostic tests is taken care of by in-house doctor and Teacher-Management team. From arranging meals for patient to allotting staff as attendants during period of hospitalization etc. is taken care of by this school team. - Enriched fit lifestyle program: Bi-Monthly B.M.I monitoring program with monetary bonus for shedding every kg of unhealthy weight and penalties in salaries for unhealthy gain forms, the corner stone of Healthy Teachers. - State-of-Art Annual Health Check-up:Mandatory corporatemedical complete body two-day check-up for our teachers helps in early diagnosis of lifestyle diseases or warns against advent of any ailment. Teacher’s children are given a wide range of scholarships, mentor ships and motivational support even during their higher studies strengthening a sense of ownership of the school in our teachers. Teachers are given full opportunity to bring in their families, spouses, in-laws, parents, children to show their personal achievements, innovations programs throughout the year. The families get the sense of pride in being apart of Sacred Heart Family and this nurtures a sense of ownership of the school in our teachers. Monthly Luncheon Meets : Management’s initiative to cook for staff, Musical events for teachers, Fun filled teachers excursions, Exclusive movie shows for school staff at Best Cineplexes, Adventure Staff Bike Rides, Shopping events all develop a strong bonding among Sacred Heart Teachers and Management team. The teachers’ skill enhancing training and program had a qualitative and quantitative lift. The world’s best like Dale Carnegie Foundation, Great Place to Work, TAP, Mobius, Trinity London, CamilinKokoyugave world class training experience to our teachers while seminars by CII (Confederation of Indian Industry), Bombay Psychiatric Society or Xavier’s opened new frontiers, new horizons and new dimensions for our teachers. Teachers can ‘Dare to Dream’. The smallest of ideas to most audacious of suggestions by teachers are approved in a zify, on a daily basis and executed in lightning fast speeds. This emboldens our faculty to dream bigger. Sacred Heart School is a place where fiction has turned to reality, with the establishment of the world’s most advanced digital lab consisting of 3d printers, high tech video walls, robot arms from ABB Robot, E-library for students as well as teachers. The 40-seater Planetarium (constructed in 95 days), or the 18000 Sq.ft. National Sports Academy (constructed in 165 days), are wonderful examples how fast, biggest of ideas from teachers are executed with breathtaking speeds. Numerous experiential community programs are initiated by the COO. - The Marathwada Gevrai-BashiCHECK-DAM project which will change the lives of 1500 villagers, whose lives were drought ravaged, forcing them to migrate to faraway towns to earn a living as manual labourers while living on footpaths, even though they had acres of land holding and owned decent homes. This village in rainfall deficient Marathawada, had a 2 km. 100 ft. wide rivulet through which the precious little rain water would simply flow out into the Godavari river during rainy season. - Our school musical band organised a fundraising musical concert, and raised Rs. 4 Lakhsas seed-money for Rain Water Harvesting project for Gevrai-Bashi village. Sacred Heartians set an Asia-Pacific record for largest volunteer program in building 10 Homes and refurbishing and repainting 2 Community Halls in Adivasi Village ‘Dongarpada’, Karjat. - Sacred Heart School partnered with Ramon Magsaysay Awardee Mr. Anshu Gupta ‘GOONJ’ to provide for hundred of recyclable school bags, shoes, stationery, uniforms, used papers etc. under the philosophy ‘Cash from Trash’ and Dignity of the marginalized.